If you have been hearing about Lifestyle lift and wanting to know if it is for real or are considering a face lift, you should come see me about Silhouette lift, offered at CB Skin Secrets! This is a revolutionary procedure which is safe, affordable and does not require a hospital stay or general anesthesia. Need to see it to believe it? 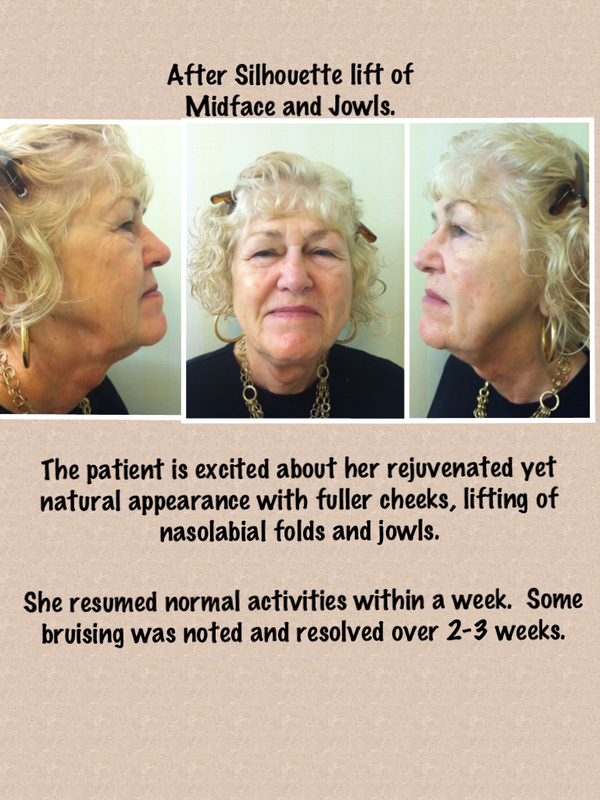 Below are before and after pictures of CB Skin Secrets 1st Silhouette Midface and Jowl patient. The procedure is done in clinic as an outpatient with local anesthetic in about an hour or so. It is recommended that you have someone drive you home as postcare instructions include limited motion of the treated area (head turning, etc.). Generally in 3-5 days you can return to most routine activities. Results last years and further tightening can be done if desired. All this at a fraction of the cost of a traditional face lift, not to mention a less invasive procedure with less discomfort and less risk. See more at silhouettelift.com and make your complimentary consultation with Dr. Stacey E. Whitehead online by clicking here or call 712-396-7899 to leave a message. You can achieve your aesthetic goals right here in Council Bluffs, Iowa! This entry was posted on October 1, 2012, in Uncategorized and tagged cb skin, cb skin secrets, council bluffs, Dr. Whitehead, face lift, iowa, lifestyle lift, lift, lovely, rejuvenate, rejuvenation, Silhouette Lift, skin, skin care, suture face lift, youthful. Bookmark the permalink.